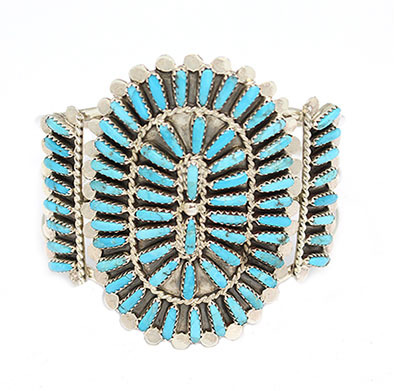 This pettipoint bracelet is made with stabalized turquoise stones and set in sterling silver. Top measures approximately 2 1/2" long by 1 7/8" wide. The side pettipoints measure 1 5/8" long by 1/2" wide. It is on a 3 wire shank. It is Navajo hand made by Lavell Byjoe. Color shade of turquoise will vary.